“Shaping the Post-Crisis World” is their title, and Vladimir Putin will be addressing the world community at the Davos economic forum, presenting his expert opinion alongside his Chinese counterpart. 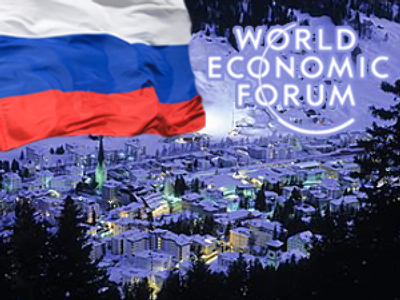 “Shaping the Post-Crisis World” is the theme of this year’s Davos Economic Forum, where Russia’s Prime Minister Vladimir Putin addressed the world community presenting his expert opinion on the subject alongside his Chinese counterpart. Putin spoke about the crisis, outlining his ideas on the post-crisis period and underling the necessity of reviewing the current economic situation in order to avoid a future crisis. In his 40-minute speech, the Prime Minister touched on all aspects of world economics, from why the dollar should not be the sole reserve currency to how the world needed to enter into a smart energy partnership with Russia. Putin addressing the world economic elite is a novelty. Kirill Bessonov, a political analyst, points out that in previous years and, indeed, for the eight years that Putin was President, Russia was never asked to participate in the forum in this way. According to Bessonov, the switch in policy is a landmark event in the world’s attitude towards Russia. “What we are witnessing is a feeling of general confusion on the world economic and political scene and a subsequent search for alternative routes,” the political analyst said. This alternative route could involve a closer partnership with Russia in order to tackle the turbulence of the world economic crisis. The EU’s dependency on the Russian economy was demonstrated recently in the Ukrainian gas dispute, which left thousands of European homes without heating. “Putin will attempt to paint Russia as a willing player looking to deepen its integration into the global economy and eager to attract global investors,” said James Beadle, chief investment strategist at Pilgrim Asset Management in Moscow, as quoted by Bloomberg. During his speech, Putin assured his audience that he would keep Russia open to foreign investors and painted it as a reliable partner in energy, trade and politics despite the economic crisis, which has dragged Russia’s growth rates down and drastically reduced its revenue from oil, a major export. Of course, the groundwork for a revamped partnership between Russia and its global associates is a two-way street. Russia’s interests, according to Putin, lie predominantly in the fact that almost 50 percent of the country’s gold and currency reserves are in the American economy. It is therefore unsurprising that the Russian government displays such interest in the condition of the U.S. budget deficit. According to Bessonov, a large number of country and corporate representatives will not attend the forum due to a feeling that increasing globalization and worldwide interdependency is to blame for the aggravation of the global financial crisis. The list of those who have opted not to attend the elite economic event includes such major global corporations as Goldman Sachs and Sony. The U.S. is sending only one top Obama advisor and confidant, Valerie Jarrett. “The current economic crisis is so deep specifically because of such a high level of mutual integration. Some countries think that because of previous Davos Forums and excessive communal economic strategizing the slump has reached such an acute level,” Bessonov said. Some analysts are sceptical of the BRIC countries’ potential to preserve a steady course of growth. At last year’s Davos Forum, Finance Minister Alexey Kudrin, labelled Russia as the “island of stability” in the world economic arena. Now, analysts are not so confident in confirming this claim. In the past six months Russia has drained $US 201.9 billion, or 34 percent, of its reserves, the world’s third-largest, to stem a 30 percent slump in the rouble against the dollar since July 2008. However, in an interview to Bloomberg on January 25, Putin pointed out that he is confident, given the current climate of mutual interdependence, that all the countries attedning the forum will be interested in working out common ground rules for the global economy. Vladimir Putin was joined by his Chinese counterpart, Wen Jiabao, in opening the forum as representatives of nations which, after rapidly rising to the status of key players in the world economy, have managed to remain islands of relative financial stability. Goldman Sachs Group Inc. Chief Economist Jim O’Neill, as cited by Bloomberg, predicts the BRIC economies of Brazil, Russia, India and China will cushion the developed world’s recession. For the Chinese Prime Minister, the address to an audience which included over 40 world leaders was a chance to persuade Europe and America not to let protectionism prevail and not to go hard on China on trade and currency issues. Nevertheless, Jiabao did not hesitate to blame the U.S. for the world economic crisis. “Inappropriate macroeconomic policies,” an “unsustainable model of development characterized by prolonged low savings and high consumption,” the “blind pursuit of profit” and the “failure of financial supervision” all contributed, he said.